Naturally, when something becomes part of your everyday life, you assume that everybody around you is as interested in and informed about that subject as you are. For example, when I left tech writing I was stunned to find that everybody does NOT in fact have a basic level of competency in HTML/CSS, and at least a passing familiarity with XML. I’m pleased to announce that I now understand most of you don’t REALLY care about the technical differences between Adiprene and Boost, though I still trot those out for customers to reassure you that I DO have a basic level of competency in running footwear. It’s not the shoe your friend/neighbor/some random running celebrity says is the best. The celebrity is paid to say that. The friend/neighbor probably isn’t paid, but there’s a high likelihood their feet, injury history, and running goals are not identical to yours. It’s not the shoe that won the latest awards in Runner’s World/Running Times/Competitor, etc. Yes, if you read deeply enough, you can find legitimate information in those publications’ review. BUT, magazines are businesses. As such, they are highly dependent on ad revenue from shoe companies. Sometimes, my coworkers and I make a game out of guessing which shoes the reviewer actually liked and which ones they are totally BSing on. 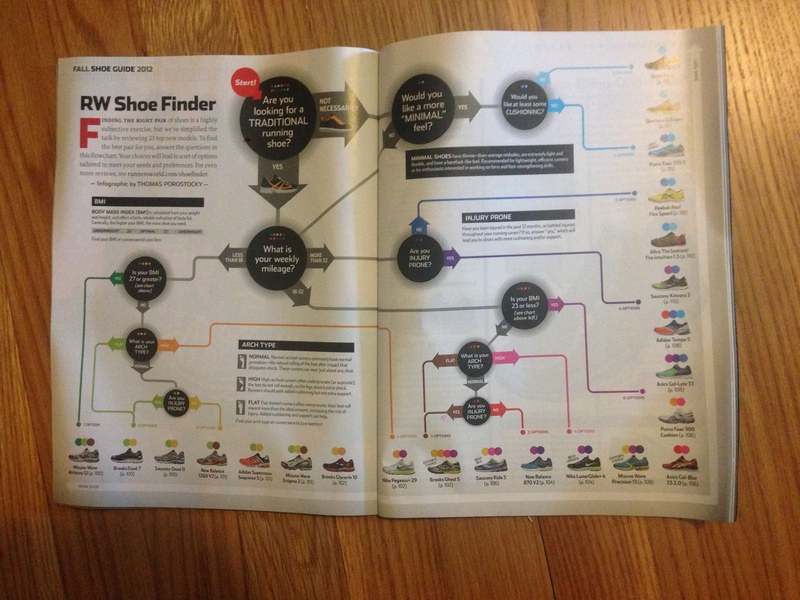 For the love of God, it is NOT the shoe that some multi-colored decision tree lead you to! Bangs head on table. Every running store employee’s worst nightmare. It’s not the shoe your podiatrist “prescribed”. We have one doctor in town who is notorious for sending people out with a prescription for “Asics, Adidas, Brooks Pure, or Mizuno Wave”. Mizuno currently makes 14 different shoes named the “Mizuno Wave [something]”. They range from a 2.2oz rubber-soled sock to a 10oz, massively-treaded, trail-running beast. I’m sure this doctor knows a lot about feet, but clearly he or she is not quite up-to-date on the Mizuno run specialty product range. A good doctor will never prescribe a shoe. They *might* give you a custom insert, but will still send you to a reputable running store for the shoe itself. It’s not the shoe I personally am wearing. For one thing, I’ve spent years working my way “down” the shoe chain from massive motion control shoes to relatively lightweight varieties. It can be done, yes, but I personally believe it must be done slowly and methodically, so that those of us with less-than-ideal biomechanics can develop the appropriate muscles to avoid serious injury. The idea that anyone can go from a heavy support shoe to running like our barefoot ancestors overnight is why Vibram is now paying out $3.75 million to settle a class-action lawsuit. Also, I probably got that shoe deeply discounted or for free. That’s right. One of the biggest perks of working in the industry is that we get major deals on running shoes. Why? Because if we run in a shoe, we are WAY more likely to bring it out to a customer. You better believe I’ll run in my second-favorite shoe if it’s free. The pro side of this for you is that I now understand we can ALL run successfully in all sorts of different shoes. The con side is that I have to bite my tongue when you say you “hate Nike” or “only run in Brooks”. So what IS the best shoe for you? Far more shoe-obsessed people than myself have written extensively on that topic, but here’s the nutshell version: It’s the shoe you don’t notice when you run in it. Think about it. There is so much to notice on a run – your breathing, your heart rate, how fatigued various muscles are, the singing birds, traffic, the dog that’s been chasing you for 3 blocks – that if you’re focused on your shoes, something is NOT RIGHT. 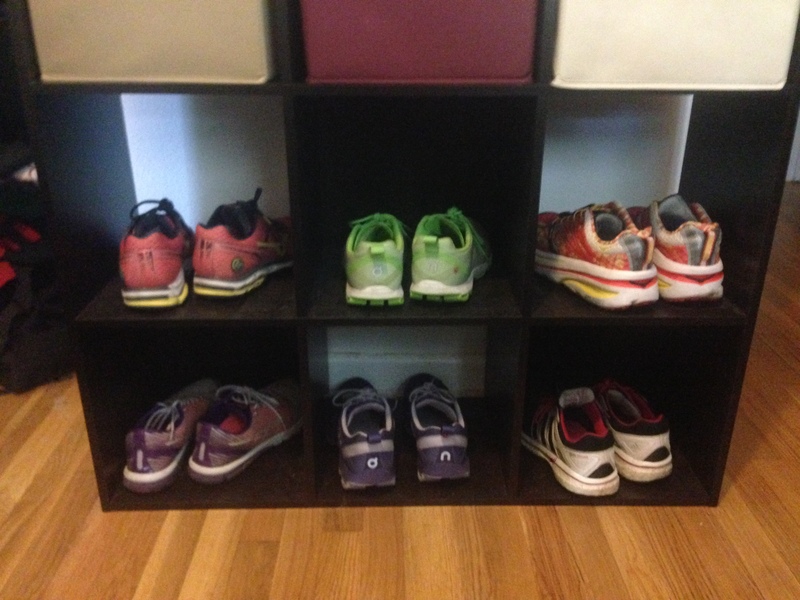 Good article and your shoe cubbies look really nice. This entry was posted on June 11, 2014 by RunFiestaGal in behind the scenes, injuries, shoes and tagged behind the scenes, shoes.